It's common to get busy and put off car maintenance (we've all been there) - but preventing minor issues from becoming major car trouble is easier and less expensive than you think. In fact, proper car care can save you up to $1,200 a year in emergency repairs, says automotive expert Lauren Fix. 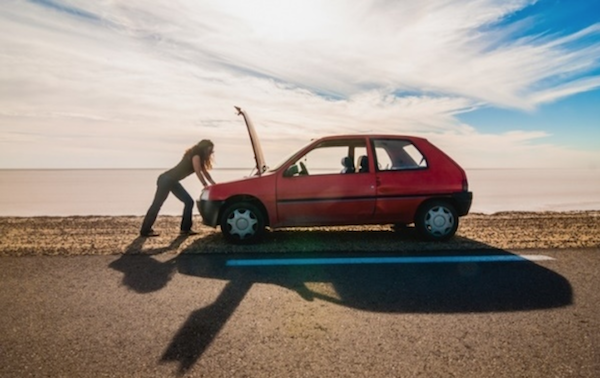 Here are her tips for bypassing the most common warm weather car issues without breaking a sweat. The sight of a "service engine soon" light can mean many different things - some simple enough to fix yourself (like a cracked or loose gas cap, the second most common culprit) and others requiring a trip to the mechanic. Prevent It: Read the service schedule and stick to it to keep things running in tip-top shape (find out which maintenance moves you can easily take care of yourself here). Between a major uptick in construction and more people on the road, flats are more common during the summer. It's a good know how to fix a flat yourself, but it's even better to give tires regular TLC to reduce the chances of a blowout in the first place. Prevent It: Set a reminder in your phone to check your tire pressure once a month. Look for a sticker on the inside panel of the driver side door for the recommended PSI (pounds per square inch). To add or release air, use an air compressor or a gas station air machine. While you're down there, check the treads, too, to make sure they're not worn out. (Here are 5 signs you need new tires.) Don't forget to check the air pressure in your spare tire as well. Keep your eyes on the temperature gauge and look out for an "engine overheating" message or lit radiator icon on your dashboard. You may also notice steam coming from the hood. If you smell gas, that's a different problem - most likely a fuel leak. Prevent It: Check your coolant levels at the beginning of every season. If the liquid doesn't reach the FULL line on the reservoir, add a 50/50 mix of water and coolant until it does. Although most people associate a dead car battery with winter, just like with the cooling system in your car, soaring temps can put extra stress on the battery and cause battery fluid to evaporate. Prevent It: Head to any major chain auto store to have a professional check your battery, starter and alternator (it's usually free). And while it's OK to leave your devices charging for a few hours with your car off, leaving them plugged in overnight will most likely require a jump start the next morning. If you're ever stranded on the road, having Emergency Road Service with GEICO can get you the help you need in a hurry - and at your fingertips through the GEICO Mobile app. Add this coverage to your policy for just pennies a day per vehicle for peace of mind wherever the summer takes you.